Karch Kiraly has been a winner at every level of volleyball. 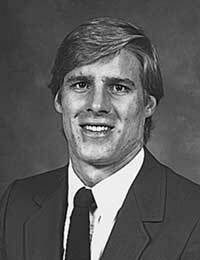 He led an unbeaten Santa Barbara HS team to the CIF championship and was MVP, and then played on the USA Junior Team that won the 1978 and 79 Pac-Rim events. He was MVP in 1979. He attended UCLA where the Bruins under Al Scates won 3 NCAA titles in four years with one runner-up finish. He was a four-time All-American and NCAA MVP his senior year and started on two of the three undefeated teams in NCAA men’s college history. He has the best four-year playing record in men’s VB at 123-5. After college he immediately moved into a starting outside hitter position on the USA National Team that won the first two USA Olympic Gold Medals in 1984 in Los Angeles and 1988 in Seoul where he was team captain. Internationally the USA also won the 1983 and 85 NORCECA Games, the 1985 World Cup (he was MVP), the 1986 World Championships, and the 1987 Savin Cup and Pan-American Games. He won another gold medal in beach volleyball in the 1996 Atlanta Olympics. He has been television broadcasting all levels of volleyball for over 25 years. He turned to indoor women’s coaching in the later 2000s and was the first assistant coach for the 2012 USA silver medal winning team in London for Hugh McCutcheon and was head coach for 2016 USA Women’s team that won the bronze medal in Rio. He will coach the USA women in 2020 Tokyo Olympics. He became a member of the International HOF in 2001 and the AVCA College VB HOF in 2005. Kiraly was voted as the greatest volleyball player of the 20th century by the FIVB and the USAV MVP of the 75th All-Anniversary team (1978-2003).